Understanding why,when and where people feel the need to wear glasses helps us to recommend lenses to suit . Our guide is to highlight available options and dispensing opticians have the training and experience to advise their patients on the right lens options and coatings to suit an individuals lifestyle and visual needs. Discussing lifestyle helps us to recommend the most appropriate lens coating for reflection free clarity and a better visual experience.Premium coatings will block uv or enhance colour vision, block blue light from digital devices or filter glare when driving at night as well as offering scratch resistance and a no quibble warrenty against accidental damage to the lenses! 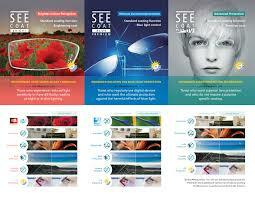 It is sometimes good to have one pair of glasses for everthing Our range of photochromics offer just this. Clear indoors and at night and a dark tint in bright sunshine they offer the conveniance of not having to carry an extra pair of glasses for the sun. Also available in our lens portfolio is the new Vantage Transitions which don’t just adapt to changing light, they also polarise as they darken, enabling you to say goodbye to glare! 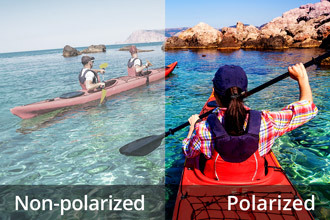 Polarising lenses eliminate glare, enhance colour and contrast,and protect the eyes from damaging UV rays. Thet are great for driving, sports and other outdoor activities, and for people sensitive to light. Available to prescription , polarised lenses are available across a wide range of materials and designs. In this digital age incredible demand is placed on our eyes when using computers,tablets and smart phones leading to fatigue. Our range of anti fatigue lenses help your eye adapt to theses demands by providing some gentle magnification for close and intermediate work. In part 2 discover more about occupational lenses and their uses and why there are so many varifocal types available.